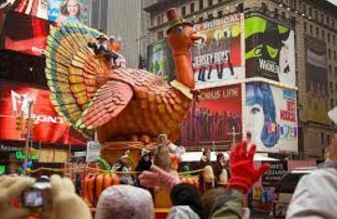 Happy Thanksgiving Day to all my dear readers and cineastes and lovers of theatre! The most interesting thing to me about the just-announced Indie Spirit Award Nominations is that BOTH Cate Blanchett AND Rooney Mara landed in the Best Actress race. Probably effectively canceling each other out. Both here and at the Oscars. The Golden Globes have said that Mara is a lead. And she is. Blanchett and she are equal co-leads. 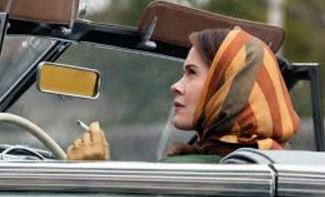 And now that the Indie Spirits have followed the GGs placements, I think Blanchett and Mara will repeat this and both land in the Best Actress category at the Oscars come January. 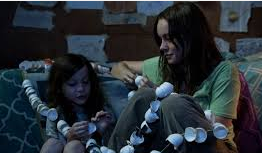 Also, poor “Room.” If ever there was an Indie Spirit film, it was “Room.” It needed to get more than just Brie Larson in Best Actress, which she totally deserves. 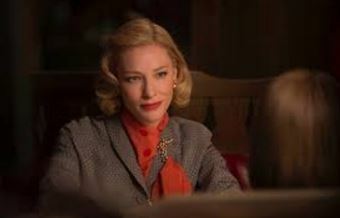 She’ll win it, and Blanchett and Mara, will, as I said, split the “Carol” vote. Indie Spirit Awards are for VERY low-budget films that are financed in America. So, like for instance “The Danish Girl” and “Brooklyn” among others were not eligible here. While the shot on an iPhone “Tangerine” about drag queens in LA WAS. And its’ two trans stars WERE nominated, Kitana Kiki Rodriguez is up against Cate Blanchett, Rooney Mara and Brie Larson, which I think is some kind of wonderful. Mya Taylor also of “Tangerine” also trans landed in Best Supporting Actress! Unfortunately, both blonde Supp. Actress wannabees, Elizabeth Banks for “Love and Mercy” and Rachel McAdams for “Spotlight” did not get in, but McAdams of course was included in the Ensemble Award that “Spotlight” was handed just out right. Too bad they don’t have a Best Ensemble Oscar. Below are the list of all the nominees. Sometimes a critic’s life is a delightful and even hilarious one. And one such night a couple of weeks back, I got a very pleasant surprise when I stumbled in to the first presentation of Hot Nights @ a Cool Shul at the Actor’s Temple on W. 47th Street. I didn’t know what to expect, but I went. Imagine my surprise to be treated (and educated!) to a first rate documentary on a subject dear to everyone’s heart, Great Comedy! It was a screening of “When Comedy Went to School” and it was FUN-KNEE! I mean hysterical! And the place was packed and the audience came primed to laugh until they split their britches and I think some did! It was an uproarious history of the great Jewish comics, who so dominated American humor in the middle of the last century, and who all got their training in the Catskills in the 1940s and ’50s at legendary hotels like Grossingers. The big hotels there were filled with the top comics, who then went on to keep so much of America entertained on television when I was growing up in the Bronx. Ed Sullivan, who was not Jewish, booked all these great entertainers from Sophie Tucker to Jerry Lewis and brought them all into our homes every Sunday night in the ’60s and ’70s, making America laugh. Sid Caesar, Woody Allen, Mel Brooks, Joan Rivers, Totie Fields, the list was endless, and they are all there in this sharp, funny film. 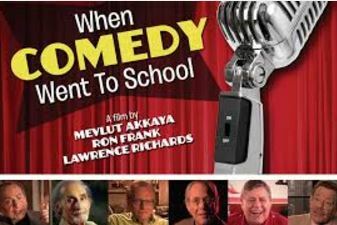 And “When Comedy Went to School” kept you laughing non-stop with all the top comics doing their best bits. I roared til I plotzed! Every headliner is represented in this terrific film, which if it pops up again at a theater near you, you must run out and see it! You won’t be disappointed. The moment that stayed with me the most, was when a very sympathetic and toned down Jerry Lewis who told in an interview(see above picture) that he used to make $7o0 a night as a busboy! He was so funny, he kept dropping things and doing schtick, he said, that customers just kept shoving tips at him. He was told not to tell the waiters because they’d get jealous! Laughter as they say is the best medicine, and it was being served that night in large doses of mirth at the Actor’s Temple, a historic landmark right in the heart of the theater district. It has quite an incredible history, and has had a historic commitment to serving Jewish theater artists and the greater NYC arts community. The list of the greats who worshiped there is just jaw-dropping, Shelley Winters, Edward G. Robinson,Sophie Tucker (as I said), Jack Benny and yes, even the Three Stooges! This first night in a series of evenings that all begin at the Temple at 7:30pm was produced by the redoubtable, indefatigable and GLAMOROUS, Carol Ostrow, who is sort of a legend herself in New York Theater circles. Next in their Hot Nights @ a Cool Shul series is the Epichorus, a Judeo-Arabic music group. I think the word is Klezmer band and that is on Monday, December 14. Shul, by the way, is the Yiddish word for “school” and I did feel I was learning A LOT about where great comedy comes from that night. You can find out more info and about tickets at their website http://www.theactorstemple.org/events or call (212)245-6975. The hardest thing in the world is to write a suspenseful thriller for the stage. And octogenarian Hollywood veteran William Goldman has done just that. 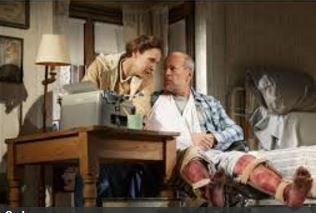 In translating his great 1990 screenplay of “Misery” into a play that keeps you at the edge of your seat, he has solved all the writing problems, all the possible screen-to-stage glitches are not present, and scared me to death in the process. I bit all my nails off! Based on the book by Stephen King, it is set in a remote, lonely, snow-bound house in the Rocky Mountains in Colorado. Nobody goes near ex-nurse Annie Wilkes and you can soon see why. As embodied by the terrific Laurie Metcalf, I can see a Tony Award in her future. 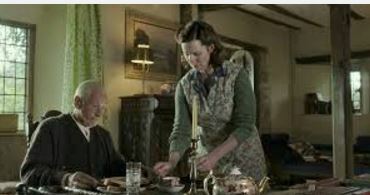 Just as an Oscar win was in the future of Kathy Bates in the film version of “Misery.” Sure, she chews up the scenery and nearly eats Bruce Willis’ bed-bound novelist Paul Sheldon for dinner SEVERAL times,but that’s the part! And what a part it is! Metcalf has to summon the horrors of Hannibal Lechter, Cruella de Ville, Ursula the Sea Witch, and others,to horrible to mention, and she does, brilliantly. It’s only 90 minutes with no intermission. So that is claustrophobic in and of itself. An intermission would let the audience get up, walk around and breathe, and escape the horrible catastrophic confinement that Willis’ successful,rich, globe-trotting novelist finds himself in. He’s being held prisoner, you see, by his “#1 fan” Ms. Wilkes. Both his legs have been broken in a car crash in a blizzard in the mountains and he was “saved” by god-fearing, good nurse Annie, who was following him in her car. OR DID SHE FORCE HIS CAR OFF THE ROAD??? 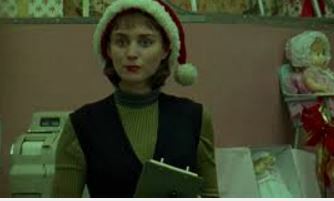 In the previous iterations of “Misery”, it is implied that Annie has had a background as a serial-killing nurse, who murdered double-digits worth of her patients. 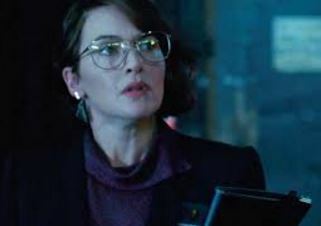 Not so here, but Metcalf is so truly frightening in her dowdy, down-trodden way, she becomes everyone’s worst church lady nightmare. And Willis? Well, he just has to lie there and be Bruce Willis. And he does, very believably, and audiences will pack in to see him suffer the torments of the damned. And enjoy it! But he’s no slouch in the acting department. He, though bed and wheel-chair bound, for most of the play, is keeping up with the oh-so-mad Metcalf beat for beat, as they execute the fatal pad-de-deux of a best-selling author, and his Number One Fan. It’s set in the 1980s, which makes the whole cut-off-from-the-world-by- a-phone-line-being-down-in-a-blizzard plot point, believable. Imagine if it was set today with all the social media available to someone like Willis’ Paul Sheldon? It wouldn’t be the same play. But it is a perfect Grand Guignol period piece, and the round table set by David Korin, keeps Annie’s bizarre house of horrors spinning. And the lighting by David Weiner, the sound design by Darron L. West and the original music by Michael Friedman are all spookily perfect in their way. Well, Mr. Goldman certainly knows plenty.The author of the screenplays for “Butch Cassidy and the Sundance Kid” and “All the President’s Men”,he’s showing a dazzling range with “Misery.” He’s written a perfect stage thriller that could run for years. And probably will. I wondered how a stage version of “Misery” would play, and it does, like gang-busters.